Have you traveled the entire North Carolina coastline? If so, you have traversed 3,375 miles of shoreline and 300 miles of “unspoiled” beach. Please join me in a big-picture tour. The beaches of the far south include Ocean Isle, Holden Beach, Oak Island, Southport, and Bald Head Island. This area between Calabash and Wilmington is known as the N.C. Golf Coast, with approximately 35 golf courses. Wilmington is the largest city on the North Carolina coast, and is a major port. Here you’ll find the historic river district of Wilmington, Battleship North Carolina, and the N.C. Azalea Festival in April. Beaches around Wilmington are Kure Beach, Wrightsville Beach, and Carolina Beach. One of four NC coastal aquariums are located at Fort Fisher – along with a famous Civil War fort that was pivotal to military ship traffic and supplies. Jacksonville and the Camp Lejeune military base limit public access to much of this coastline. Just outside of these beaches are the towns of Morehead City and Beaufort, where you will find the relics of Blackbeard’s Queen Anne’s Revenge ship at the N.C. Maritime museum. The Outer Banks are series of islands connected by roads and a ferry system. Cape Hatteras, on the south side of Outer Banks, was named as the first national seashore in 1953. The largest sand dunes in the United States are found on these beaches. Among seven lighthouses on the N.C. coast, four of them are located on the Outer Banks. 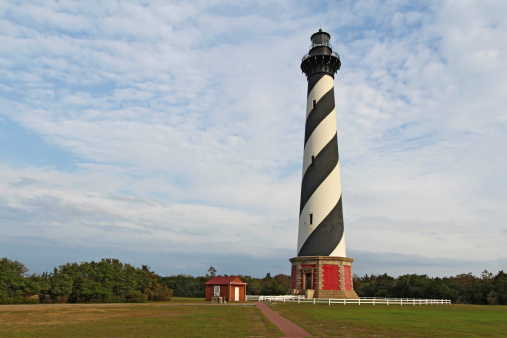 America’s tallest lighthouse is Cape Hatteras at 208 feet. So much history along the Outer Banks, such as the Wright Brothers first flight and the first English settlement in the New World on Roanoke Island. The midpoint of Intracoastal Waterway is met by the Chowan, Roanoke, and Neuse rivers and is outstanding for sailing, fishing, and recreation. You’ll also find historic cities such as Bath, Edenton, Elizabeth City, and New Bern. Blackbeard the pirate resided in these areas, and Tryon Palace in New Bern was important during the Revolutionary War. If you haven’t been to the North Carolina coast, it’s time for a visit. If you’re practically a native, consider exploring someplace new. For more information, visit NC Beaches and Visit NC. And if you’ve decided the coast is the place for your second or retirement home, please contact an Allen Tate Realtor® to put you in touch with an outstanding local agent who specializes in this area. PS – We didn’t forget South Carolina. We’ll be heading to beaches there with a blog in mid-August. Great blog Tony. It’s nice to have it laid out so simply. It’s sometimes overwhelming to hear a local talk about all the beaches to us Yankees who haven’t begun to explore yet. Hi Tony Good to see your Blog.